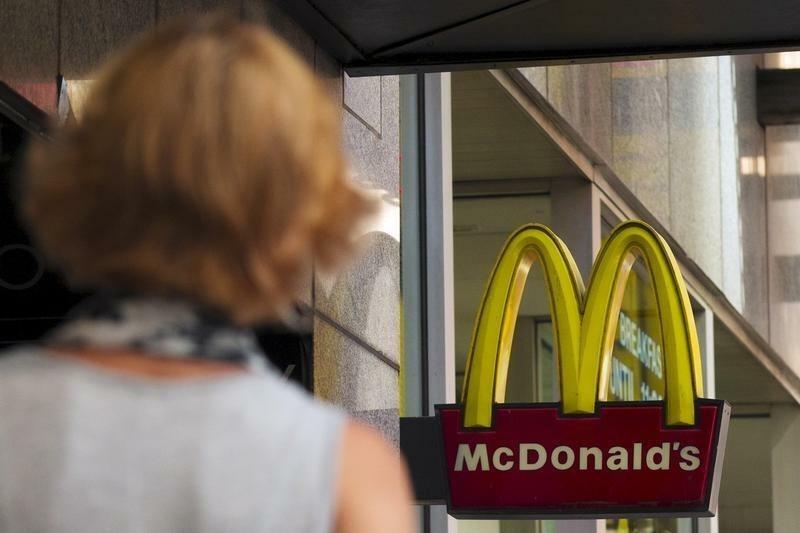 (Reuters) - McDonald's Corp (MCD.N) shares hit an all-time high on Thursday after Chief Executive Steve Easterbrook said a rebound in quarterly restaurant sales showed that his turnaround plan is starting to work. Global sales at established restaurants were up a much better-than-expected 4 percent in the third quarter, ending six straight quarters of flat or falling results. And, Easterbrook said, the trend would continue in the current quarter. Shares of the world's biggest restaurant chain by sales jumped more than 8 percent to a record $110.88 in early trading as a renewed focus on value and service helped business around the world. "The progress we have made in a short amount of time gives me confidence we're making the right moves to turn around our business and reposition McDonald's as a modern, progressive burger company," Easterbrook said on a conference call with analysts and investors. The United States, McDonald's No. 1 market for profit, reported a surprise 0.9 percent increase in sales at restaurants open at least 13 months. McDonald's said a new Premium Buttermilk Crispy Chicken Deluxe sandwich and its decision to swap butter for margarine on its Egg McMuffins helped the division break a two-year streak of quarterly sales declines. China's same-restaurant sales, which had plummeted after a food safety scandal in July 2014, were up a whopping 26.8 percent for the quarter, helped by a focus on value and breakfast. Australia, the United Kingdom and Canada also contributed to the quarterly rise in sales at restaurants open at least 13 months, after McDonald's tweaked menus, improved service and refined its offering of inexpensive food. Easterbrook, now eight months into his tenure as CEO, has announced plans to speed up service, simplify menus and boost food quality. In the United States, he rolled out all-day breakfast, began switching to chicken from birds raised without important antibiotics and raised wages for workers in restaurants run by the corporation. On Thursday, Easterbrook said winning back customers remains a top priority in the United States, where competition is fierce and speed is key. All-day breakfast, launched Oct. 6, is part of that effort. While that move appears to have boosted traffic, some domestic franchisees complain that all-day breakfast and the company's plans to customize sandwiches is complicating operations and slowing service. Easterbrook said restaurant operators have embraced all-day breakfast, and that an early read suggests it is "an incremental profitable business" wooing new and existing customers. On the other hand, McDonald's said its decision to raise wages and improve benefits for 90,000 workers in U.S. company-operated restaurants took a bite out of operating income. Third-quarter net income was up 23 percent to $1.31 billion, or $1.40 per share. Revenue fell 5 percent to $6.62 billion. Chief Financial Officer Kevin Ozan said the strong U.S. dollar would ding fourth-quarter earnings per share by 8 to 10 cents. McDonald's gets about one-third of revenue and more than half of its operating income from outside the United States. At midday, McDonald's shares were up 7.5 percent to $110.20.